Secular Pro-Life Perspectives: Abortion: A Mercy Killing? In my experience, most abortion debates start with the "clump of cells" argument, then move on to the mother's right to bodily autonomy. But somewhere along the line, we inevitably fall down the rabbit-hole discussing the potential future of suffering this fetus would most certainly live. We (pro-lifers) are told: This isn’t just about life, it’s about quality of life. Don’t you understand this fetus would grow into another foster child? Another poor struggling child? Another disabled person? How could you subject someone to that life? This isn’t a selfish decision by the woman, she is making the honorable choice by not inflicting this inevitable life of suffering onto her child. With the thousands of children already in foster care and suffering in poverty, how could you want to add more children to the mix? With all the suffering the disabled go through, how could you subject someone else to that suffering? It’s about the greater good. From conception, a unique human being comes into existence, with DNA that never existed before and will never exist again. Abortion causes the death of that individual and all of her (or his) potential. No matter what class or group of people she might have joined after birth, she had unique distinct worth. How is the greater good served by the devaluing of fellow human beings based on their characteristics or life experiences? Abortion supporters say that a so-called clump of cells is only potential human life with no value, so we lose nothing despite the fact the unique person this “clump of cells” would have become will never exist. But what about the already-born? We all agree they have worth, right? What do these pro-choice "mercy killing" arguments say to people who are impoverished or differently abled? It's hard enough to maintain your self-worth against constant attacks from abuse, neglect, abandonment, lack of resources, and societal disrespect and judgments. Our society is poorly structured. People who are differently abled or differently formed may struggle to fit in; they may be bullied at school. They may undergo countless surgeries and other medical procedures. All the while they all may feel like a burden to those around them. These arguments are not about women’s rights. 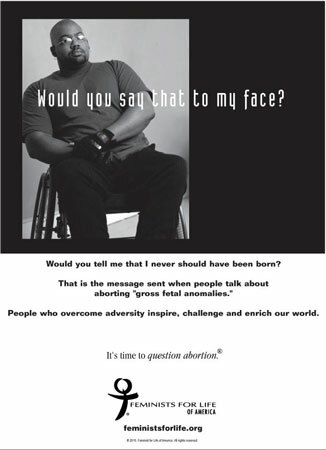 In fact, these arguments pass stereotypical judgments on women seeking abortions and their abilities. They reinforce a woman’s choice to abort as the “right” one because she could not have possibly given her child a life worth living. These arguments are about the child and the life that child would live. These arguments are prospectively deciding the worth a person’s life will have, assuming that the difficulty they will face outweighs the value they can add to the world. I have worked intimately with those belonging to these populations. I have worked with children and adults who have been severely abused. I have worked with those who struggle with the daily tasks we take for granted. I have been brought to tears by individuals’ stories and the hardships they have faced. But, you know what? I have not met one person whose life was not worth living or whose potential was not worth having in this world. We have made great strides in this society towards inclusion. Many are working very hard to address poverty and its symptoms. Of course, this work is not assisted, but only hampered, by ideas that certain individuals are better off dead than alive; that in this “progressive” society certain characteristics and experiences detract from a person’s worth. The problems faced by children and families involved in foster care need to be addressed. The problems faced by those who are differently abled need to be addressed. These human beings’ very existence is not and cannot be treated as the problem, though. All of these individuals need to be met with compassion. While we may still disagree about the worth of those still in the womb, I hope we can all agree that all of us “post-birth” individuals are equally human, and deserve equal dignity. In a truly progressive society we must not denigrate anyone’s life or existence by passing judgment on it as “not worthwhile.” In history, we have seen what happens when one needs to prove more than human DNA to gain meaningful membership to the human race, when those who are different are assumed to be inferior and less worthy.